Nymphal and adult deer ticks can be carriers of Lyme disease. Nymphs are about the size of a poppy seed. Lyme disease or Lyme borreliosis is the most commonly reported vector-borne disease in the Northern Hemisphere. Caused by infection with the spirochetal (helical) bacteria Borrelia burgdorferi, Lyme disease is primarily transmitted to humans, as well as dogs, horses and other domesticated animals, by the bite of infected ticks. There is controversy regarding how prevalent the disease is, and competing perspectives on diagnosis and treatment (see The Lyme controversy below). However, there is uniformity regarding prevention strategies, with the core element being personal responsibility. Lyme disease was first documented as a skin rash in Europe in 1883. Over the years, researchers there identified additional features of the disease, including an unidentified pathogen, the disease's response to penicillin, the role of the Ixodes tick (wood tick) as its vector, and other symptoms, including those affecting the central nervous system. Researchers in the United States have been aware of tick infections since the early 1900s. For example, an infection called tick relapsing fever was reported in 1905, and the wood tick, which carries an agent that causes Rocky Mountain spotted fever, was identified soon after. Before 1975, elements of Borrelia infection were also known as Tickborne meningopolyneuritis, Garin-Bujadoux syndrome, Bannwarth syndrome, or sheep tick fever. However, the full syndrome, now known as Lyme disease, was not identified until 1975, when a cluster of cases thought to be juvenile rheumatoid arthritis occurred in three towns in southeastern Connecticut in the United States. Two of these towns, Lyme and Old Lyme, Connecticut, gave the disease its popular name. The infecting agent, a novel spirochete, was first identified by Jorge Benach. Soon after the spirochete was isolated by Willy Burgdorfer in 1982 – a scientist with the National Institutes of Health, who specialized in the study of spirochete microorganisms. The spirochete was named Borrelia burgdorferi in his honor. Burgdorfer was partner with Alan Barbour in the successful effort to culture the spirochete. Lyme disease is caused by spirochetal bacteria from the genus Borrelia, which has well over 300 known genomic strains. The Borrelia species known to cause Lyme disease are collectively known as Borrelia burgdorferi sensu lato, and have been found to have greater strain diversity than previously estimated. Until recently it was thought that only three genospecies caused Lyme disease: B. burgdorferi sensu stricto (predominant in North America, but also in Europe), B. afzelii, and B. garinii (both predominant in Eurasia). However, newly discovered genospecies have also been found to cause disease in humans: B. lusitaniae in Europe (especially Portugal), North Africa and Asia, B. bissettii in the U.S. and Europe, and B. spielmanii in Europe. Additional B. burgdorferi sensu lato genospecies are suspected of causing illness, but are not confirmed by culture. Some of these species are carried by ticks not currently recognized as carriers of Lyme disease. At present, diagnostic tests are based only on B. burgdorferi sensu stricto (the only species present in the United States), B. afzelii, and B. garinii. One of the most striking features of B. burgdorferi as compared with other bacteria is its unusual genome, which is far more complex than that of its spirochetal cousin Treponema pallidum, the agent of syphilis . The genome of B. burgdorferi includes a linear chromosome approximately one megabase in size, and 21 plasmids (12 linear and 9 circular)—the largest number of plasmids (double-stranded DNA molecules separate from the chromosomal DNA) found in any known bacterium . Genetic exchange, including plasmid transfers, contributes to the pathogenicity of the organism . Long-term culture of B. burgdorferi results in a loss of some plasmids and changes in expressed proteins. Associated with the loss of plasmids is a loss in the ability of the organism to infect laboratory animals, suggesting that the plasmids encode key genes involved in virulence. B. burgdorferi is a highly specialized, motile, two-membrane, spirochete ranging from about 9 to 32 micrometers in length. It is often described as gram-negative and has an outer membrane with lipopolysaccharide, though it stains weakly in the Gram stain. B. burgdorferi requires little oxygen to survive. It lives primarily as an extracellular pathogen, although it can also hide intracellularly. Like other spirochetes, B. burgdorferi has an axial filament composed of flagella that run lengthwise between its cell wall and outer membrane. This structure allows the spirochete to move efficiently in corkscrew fashion through viscous media, such as connective tissue. As a result, B. burgdorferi can disseminate throughout the body within days to weeks of infection, penetrating deeply into tissue where the immune system and antibiotics may not be able to eradicate the infection. B. burgdorferi is very slow growing, with a doubling time of 12-24 hours (in contrast to bacterial pathogens such as Streptococcus and Staphylococcus, which have a doubling time of 20-30 minutes). Since most antibiotics kill bacteria only when they are dividing, this longer doubling time necessitates the use of relatively longer treatment courses for Lyme disease. Antibiotics are most effective during the growth phase, which for B. burgdorferi occurs in four-week cycles. Some clinicians have observed that chronic Lyme patients commonly experience a worsening of symptoms every four weeks; these periodic flare-ups are thought to correspond to the growth phase of B. burgdorferi. While B. burgdorferi is susceptible to a number of antibiotics in vitro (in a test tube, or outside the living organism), there are contradictory reports as to the efficacy of antibiotics in vivo (involving a living organisms). B. burgdorferi may persist in humans and animals for months or years despite a robust immune response and standard antibiotic treatment, particularly when treatment is delayed and dissemination widespread. Numerous studies have demonstrated persistence of infection despite antibiotic therapy. Physical sequestration of B. burgdorferi in sites that are inaccessible to the immune system and antibiotics, such as the brain and central nervous system. Intracellular invasion. B. burgdorferi has been shown to invade a variety of cells, including endothelium, fibroblasts, lymphocytes, macrophages, and others. By 'hiding' inside these cells, B. burgdorferi is able to evade the immune system and is protected to varying degrees against antibiotics, allowing the infection to persist in a chronic state. Altered morphological forms, i.e. spheroplasts (cysts, granules). The existence of B. burgdorferi spheroplasts, which lack a cell wall, has been well documented in vitro, in vivo, and in an ex vivo model. The fact that energy is required for the spiral bacterium to convert into the cystic form suggests that these altered forms have a survival function, and are not merely end stage degeneration products. The spheroplasts are indeed virulent and infectious, able to survive under adverse environmental conditions, and have been shown to revert back to the spiral form in vitro, once conditions are more favorable. A number of other factors make B. burgdorferi spheroplasts play a role in the relapsing, chronic nature of Lyme disease. Compared to the spiral form, spheroplasts have dramatically reduced surface area for immune surveillance. They also express unique surface proteins—another reason for seronegative disease (i.e. false-negative antibody tests), as current tests only look for antibodies to spiral formed surface proteins. In addition, B. burgdorferi spheroplasts are generally not susceptible to the antibiotics traditionally used for Lyme disease. They have instead shown sensitivity in vitro to antiparasitic drugs such as metronidazole, tinidazole, and hydroxychloroquine, to which the spiral form of B. burgdorferi is not sensitive. Antigenic variation. Like the Borrelia that cause relapsing fever, B. burgdorferi has the ability to vary its surface proteins in response to immune attack. This ability is related to the genomic complexity of B. burgdorferi, and is another way B. burgdorferi evades the immune system, establishing a chronic infection. Immune system suppression. Complement inhibition, induction of anti-inflammatory cytokines such as Interleukin 10, and the formation of immune complexes have all been documented in B. burgdorferi infection. Furthermore, the existence of immune complexes provides another explanation for seronegative disease (i.e. false-negative antibody tests of blood and cerebrospinal fluid), as studies have shown that substantial numbers of seronegative Lyme patients have antibodies bound up in these complexes. In Europe, Ixodes ricinus, known commonly as the sheep tick, castor bean tick, or European castor bean tick is the transmitter. 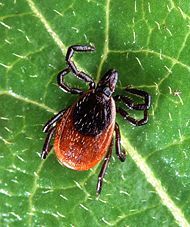 On the east coast of North America, Ixodes scapularis (black-legged tick or deer tick) has been identified as the key to the disease's spread. On the west coast, the tick responsible for spread of the disease is Ixodes pacificus (Western black-legged tick). The number of reported cases of the disease has been increasing, as are endemic regions in the United States. Lyme disease is reported in nearly every state in the United States, but the states that reported the highest incidence of Lyme disease in the 2001-2002 Centers for Disease Control (CDC) surveillance report are Connecticut, Delaware, Maine, Maryland, Massachusetts, Minnesota, New Hampshire, New Jersey, New York, Pennsylvania, Rhode Island, and Wisconsin. These 12 states alone accounted for over 90 percent of CDC positive cases of Lyme disease. Lyme disease is endemic to Northern California, Europe, and Asia as well. The longer the duration of tick attachment, the greater the risk of disease transmission, but at minimum the tick must be attached for at least 12 hours for the spirochete to be transferred. There are many urban legends about the proper and effective method to remove a tick. One legend states that something hot (a cigarette or burnt match for instance) should be applied to the back of the tick, which causes the tick to remove its head from the victim. It further states that ticks "screw" their heads into their victims; therefore, one must "unscrew" the head. These legends are incorrect and dangerous. Proper removal of a tick: use a pair of tweezers, grab the head of the tick, and pull it out. If the head is not completely removed, local infection of the person/animal bitten may result, and a doctor should be consulted (or a veterinarian if the tick was removed from a pet). In the fall, large acorn forests attract deer and mice infected with B. burgdorferi. During the following spring, the ticks lay their eggs. Tick eggs hatch into larvae, which feed on the mice, thus infecting the larvae. The infected larvae molt into "nymphs" (the ticks' "juvenile form"). Infected nymphs feed on humans from spring through summer, thus transmitting the bacteria to people. Note: on the west coast, Lyme disease is spread by the western black-legged tick (Ixodes pacificus), which has a different life cycle. Lyme disease can be transmitted from an infected mother to fetus through the placenta during pregnancy. The risk of transmission is minimized if the mother receives prompt antibiotic treatment. A causal link between infection of Lyme disease and fetal adverse effects has not been proven conclusively. Some studies suggest that Lyme disease can result in stillbirth and cardiac malformations, other studies suggest that any adverse outcome resulting from gestational Lyme disease is, at most, extremely rare. Lyme disease has many signs and symptoms, but skin signs, arthritis and/or various neurological symptoms are often present. Like syphilis, the symptoms frequently seem to resolve, yet the disease progresses. Conventional therapy is with antibiotics. People who suspect they have been exposed to Lyme disease should consult a doctor with knowledge of the disease immediately. Erythema migrans rash (EM). Also known as the "bulls eye" rash or Lyme rash, this symptom develops in about 50-80 percent of patients. . The CDC case definition describes an EM rash as "a skin lesion that typically begins as a red macule or papule and expands over a period of days to weeks to form a large round lesion, often with partial central clearing"; however, the characteristics of an EM rash can vary greatly. Rashes that are homogeneously red are seen frequently as well. Multiple painless EM rashes may occur days or weeks after an infected tick bite, indicating disseminated infection . Flu-like symptoms, such as fever, malaise, fatigue, headaches, swollen lymph nodes and sore throat. Cognitive symptoms such as memory loss and attention problems. Fatality can occur when the spirochete enters the brain and surrounding fluid, causing meningitis, or due to conductivity defects in the heart. Lyme disease is sometimes misdiagnosed as multiple sclerosis, rheumatoid arthritis, fibromyalgia, chronic fatigue syndrome (CFS), or other (mainly autoimmune and neurological) diseases, which leaves the infection untreated and allows it to further penetrate the organism. Many of these conditions may also be misdiagnosed as Lyme disease, e.g. due to false-positive Lyme serology. However it should be noted that chronic fatigue syndrome (CFS) is by definition a diagnosis of exclusion, meaning it would be inaccurate to say that a patient does not have Lyme because he or she has CFS. The substantial overlap in symptomology between Lyme and CFS makes this a crucial point. The serological laboratory tests available are the Western blot and ELISA. According to the CDC's two-tiered protocol, the ELISA is performed first, and if it is positive or equivocal, a Western blot is then performed to support the diagnosis. The reliability of testing in diagnosis remains controversial (see The Lyme controversy—Testing). False-positive results for the Western blot IgM are described with several viruses, but studies show the Western blot IgM has a specificity of 94-96 percent for patients with symptoms suggestive of Lyme disease. False-negative test results have been widely reported in both early and late disease. Polymerase chain reaction (PCR) tests for Lyme disease may also be available to the patient. A PCR test attempts to detect the genetic material (DNA) of the Lyme disease spirochete, whereas the Western blot and ELISA tests look for antibodies to the organism. PCR tests are rarely susceptible to false-positive results, but can often show false-negative results. Lyme disease can imitate other diseases very easily. The Lyme spirochete can cross the blood-brain barrier and affect the central nervous system and the brain, which is very hard to treat without antibiotics that also cross the barrier. This makes the diagnosis of Lyme disease difficult for doctors who are inexperienced with Lyme. For early cases, prompt treatment is usually curative. The severity and treatment of Lyme disease can be complicated due to late diagnosis, failure of antibiotic treatment, simultaneous infection with other tick-borne diseases, and immune suppression in the patient (sometimes resulting from inappropriate treatment with steroids). Patients with chronic Lyme disease have been shown to experience a level of physical disability equivalent to that seen in congestive heart failure. The disease is rarely fatal in and of itself, although deaths have been reported. The best prevention involves avoiding areas in which ticks are found, reducing the probability of contracting Lyme disease. Other good prevention practices include wearing clothing that covers the entire body when in a wooded area; using mosquito/tick repellent; after exposure in wooded areas, check all parts of the body (including hair) for ticks. Traditional treatment of acute Lyme disease usually consists of a minimum ten day to one-month course of antibiotics. Oral antibiotics do not reliably cure the disease except in the very early phase, before the bacteria have a chance to disseminate throughout the body and cross the blood-brain barrier. Chronic or late diagnosed Lyme is often treated with intravenous antibiotics, frequently ceftriaxone, for a minimum of four weeks. As it is thought to inhibit the once a month breeding cycle of borrelia burgdorferi, a longer course is recommended. With little research conducted specifically on chronic Lyme disease, treatment remains controversial. Currently there are two sets of peer-reviewed published guidelines; one advocates extended courses of antibiotics for chronic Lyme patients, while the other recommends no treatment (see The Lyme controversy—Two standards of care). Experimental trials of long-term antibiotics for chronic Lyme have produced mixed results (see The Lyme controversy—Long-term antibiotic therapy). It should be noted that the most important factor in treating Lyme disease is finding a doctor that is familiar with the disease and all of the possible treatments. Though there is no doubt that Lyme disease exists, there is considerable controversy as to the prevalence of the disease, the proper procedure for diagnosis and treatment, and the likelihood of a chronic, antibiotic-resistant Lyme infection. On one side of the debate are those who believe that Lyme disease is relatively rare, easily diagnosed with available blood tests, and easily treated with two to four weeks of antibiotics. On the other side are those who believe that Lyme disease is under-diagnosed, that available blood tests are unreliable, and that extended antibiotic treatment is often necessary. The majority of public health agencies such as the U.S. Centers for Disease Control maintain the former position, and recommend adherence to the IDSA guidelines. While this narrower position is sometimes described as the "mainstream" view of Lyme disease, physician surveys suggest otherwise. Studies show that physicians practicing in endemic areas in the U.S. are evenly split in their views, with the majority recognizing seronegative Lyme disease, and roughly half prescribing extended courses of antibiotics for chronic Lyme disease. EM rash Present less than 50% of the time. Studies that show otherwise often rely on CDC criteria for screening subjects, which prioritize the rash over other disease manifestations. Among those who would be excluded from such studies are: 1) seronegative Lyme patients without a rash (even if there is definitive evidence of infection such as a positive PCR), 2) seropositive patients without a rash who present with fever, flu-like symptoms, joint and muscle pain, paresthesias and/or encephalopathy (symptoms not included in the restrictive CDC case definition), and 3) late-stage patients whose diagnosis was delayed because no rash was present. The exclusion of these groups leads to an artificially high estimate of the incidence of EM rash among those infected with Lyme. "The great majority of Lyme patients" present with an EM rash, according to studies of patients with early Lyme disease diagnosed by CDC criteria. Testing Not reliable, particularly for late cases; used to support a clinical diagnosis (see Testing section for discussion). Nearly always reliable after the first few weeks of infection. Chronic Lyme disease Persistent Lyme infection exists due to various mechanisms of antibiotic resistance, particularly when diagnosis and treatment are delayed, as numerous studies have demonstrated (see Mechanisms of persistence section). Lengthy treatment regimens are sometimes required. Persistent Lyme infection is extremely rare. If symptoms remain after a standard course of antibiotics (several weeks), the illness becomes "Post-Lyme disease syndrome." Remaining symptoms are often attributed to an unspecified autoimmune process and/or the development of fibromyalgia or chronic fatigue syndrome, psychiatric disorders such as somatization, or simply stress. Primary concern regarding misdiagnosis The under-diagnosis of Lyme may lead to untreated chronic, persistent infection resulting in severe disability and possibly even death. The over-diagnosis of Lyme may lead to the unnecessary use of antibiotics resulting in side effects (most commonly nausea), and rarely, complications from intravenous antibiotics. There are also concerns about the cost of antibiotic treatment. Risk-benefit analysis The potential harm in letting a persistent Lyme infection go untreated far outweighs the potential side-effects of long-term antibiotic use. This therapy is generally safe when administered by skilled clinicians who take appropriate precautions. If it is considered safe enough for acne patients, its use is certainly justified for chronic Lyme patients. Since chronic Lyme infection is presumed not to exist, any potential adverse effects of long-term antibiotic therapy outweigh the (nonexistent) benefits. Confusion about the significance of the U.S. Centers for Disease Control Case Definition for Lyme disease lies at the heart of the controversy over diagnosis. The CDC has explicitly stated that the following definition is meant to be used for surveillance purposes, not diagnostic purposes. A number of well-documented symptoms of chronic Lyme disease including encephalopathy (manifested by memory loss, mood changes, and sleep disturbance) are not part of the CDC case definition. Therefore clinicians using the CDC criteria for diagnostic purposes may miss some patients who have the disease. Additionally, reliance on the CDC case definition for clinical purposes would result in the misdiagnosis of those with false-negative test results, a widely reported phenomenon (see Diagnosis). Sensitivity of the CDC's testing protocol. Critics argue that the CDC's 2-tiered testing protocol (ELISA test, followed by confirmatory Western blot test if positive or equivocal) misses many patients who are infected. No diagnostic gold standard to determine sensitivity of tests in late disease. Without a diagnostic gold standard to identify those with chronic Lyme disease, circular reasoning becomes a problem in studies that evaluate the sensitivity of serologic tests for this population. Bias is unavoidable if subjects are selected by CDC criteria, since late-stage patients must have tested positive previously in order to qualify for a study. Immune system evasion by Borrelia burgdorferi. Intracellular sequestration, antigen variation, immune suppression, the formation of immune complexes, and predominance of cystic forms have all been cited as reasons for seronegativity in late and chronic Lyme disease (see Mechanisms of persistence section). Positive test criteria is based on early Lyme disease. The CDC's criteria for a positive Western blot were developed based upon on a study of patients with early Lyme disease. The serologic response of patients with late-stage Lyme disease was not analyzed and incorporated, despite that fact that such cases require a positive Western blot for diagnosis by CDC standards. Specific markers for late-stage Lyme disease left out. Several highly specific antibody bands for Lyme (31-kDa and 34-kDa, corresponding to outer surface proteins A and B) were not included in the CDC criteria for a positive Western blot because they only appear late in the disease. As a result, the vast majority of laboratories do not report these bands, even if they are positive. This is one reason some clinicians use laboratories that specialize in tick-borne disease, as they usually report all antibody bands. Tests based on only one strain. Current tests at most laboratories are based on only one strain of Borrelia burgdorferi (the B31 strain is used in the U.S.) despite the fact that there are over three hundred strains worldwide and over one hundred in North America (see Strains). Several studies have found that this practice can lead to false-negatives - another reason some clinicians use tick-borne disease specialty labs, which utilize multiple strains of Borrelia burgdorferi in the preparation of test kits. 45% of those considered "misdiagnosed" in the study received positive results from another laboratory, and negative results from the authors' laboratory. However there was no independent evaluation, and no reason to assume that the authors' laboratory was superior. The authors failed to consider the phenomenon of seronegative Lyme disease (false-negatives). Rather than consider the possibility of persistent infection, the authors considered treatment failure to be evidence of misdiagnosis, i.e. patients could not possibly have Lyme if they were not cured by a standard course of antibiotics. This was also taken as evidence that all patients with Lyme respond to treatment—another example of circular reasoning. The authors excluded patients from a diagnosis of Lyme disease if they had psychiatric symptoms, despite the fact that Lyme can cause such symptoms. Testing positive after treatment. Because the tests measure antibodies to Borrelia burgdorferi and not the organism itself, it is theoretically possible to test positive even if the organism has been eradicated. All agree that no treatment is required in asymptomatic patients regardless of test results; however, controversy arises when a patient continues to have symptoms after a course of treatment. In this scenario, those who hold a conservative view believe the infection must have been eradicated by the treatment, and the positive test no longer indicates active infection but rather a persisting antibody response, regardless of the clinical picture. Those with a broader view of Lyme believe the evidence and clinical picture in this case most likely point to a persisting infection requiring further antibiotic treatment. There is little concrete evidence either for or against the use of antibiotics for chronic Lyme disease, because only a few such double-blind, placebo-controlled clinical trials have been funded to date by the U.S. National Institutes of Health, with conflicting results. ↑ Bunikis J, Garpmo U, Tsao J, Berglund J, Fish D, Barbour AG. Sequence typing reveals extensive strain diversity of the Lyme borreliosis agents Borrelia burgdorferi in North America and Borrelia afzelii in Europe. Microbiology 150 (6) (2004): 1741-1755 PMID 15184561 Full PDF. ↑ Collares-Pereira M, Couceiro S, Franca I, Kurtenbach K, Schafer SM, Vitorino L, Goncalves L, Baptista S, Vieira ML, Cunha C. First isolation of Borrelia lusitaniae from a human patient. J Clin Microbiol 42 (3) (2004): 1316-1318 PMID 15004107 Full PDF. ↑ Postic D, Ras NM, Lane RS, Hendson M, Baranton G. Expanded diversity among Californian borrelia isolates and description of Borrelia bissettii sp. nov. (formerly Borrelia group DN127). J Clin Microbiol 36 (12) (1998) :3497-3504 PMID 9817861 Full PDF. ↑ Richter D, Postic D, Sertour N, Livey I, Matuschka FR, Baranton G (2006). Delineation of Borrelia burgdorferi sensu lato species by multilocus sequence analysis and confirmation of the delineation of Borrelia spielmanii sp. nov. Int J Syst Evol Microbiol 56 (Pt 4): 873-81. PMID 16585709. ↑ Foldvari G, Farkas R, Lakos A (2005). Borrelia spielmanii erythema migrans, Hungary. Emerg Infect Dis 11 (11): 1794-5. PMID 16422006 Full Text. ↑ Varela AS, Luttrell MP, Howerth EW, Moore VA, Davidson WR, Stallknecht DE, Little SE (2004). First culture isolation of Borrelia lonestari, putative agent of southern tick-associated rash illness. J Clin Microbiol 42 (3): 1163-9. PMID 15004069 Full PDF. ↑ Masters E, Granter S, Duray P, Cordes P (1998). Physician-diagnosed erythema migrans and erythema migrans-like rashes following Lone Star tick bites. Arch Dermatol 134 (8): 955-60. PMID 9722725. ↑ Porcella SF, Schwan TG (2001). Borrelia burgdorferi and Treponema pallidum: a comparison of functional genomics, environmental adaptations, and pathogenic mechanisms. J Clin Invest 107 (6): 651-6. PMID 11254661 Full Text. ↑ Casjens S, Palmer N, van Vugt R, Huang WM, Stevenson B, Rosa P, Lathigra R, Sutton G, Peterson J, Dodson RJ, Haft D, Hickey E, Gwinn M, White O, Fraser CM (2000). A bacterial genome in flux: the twelve linear and nine circular extrachromosomal DNAs in an infectious isolate of the Lyme disease spirochete Borrelia burgdorferi. Mol Microbiol 35 (3): 490-516. PMID 10672174 Full Text. ↑ Qiu WG, Schutzer SE, Bruno JF, Attie O, Xu Y, Dunn JJ, Fraser CM, Casjens SR, Luft BJ (2004). Genetic exchange and plasmid transfers in Borrelia burgdorferi sensu stricto revealed by three-way genome comparisons and multilocus sequence typing. Proc Natl Acad Sci U S A 101 (39): 14150-5. PMID 15375210 Full PDF. ↑ Nocton JJ, Dressler F, Rutledge BJ, Rys PN, Persing DH, Steere AC (1994). Detection of Borrelia burgdorferi DNA by polymerase chain reaction in synovial fluid from patients with Lyme arthritis. N Engl J Med 330 (4): 229-34. PMID 8272083 Full Text. ↑ Bayer ME, Zhang L, Bayer MH (1996). Borrelia burgdorferi DNA in the urine of treated patients with chronic Lyme disease symptoms. A PCR study of 97 cases. Infection 24 (5): 347-53. PMID 8923044. ↑ Preac-Mursic V, Weber K, Pfister HW, Wilske B, Gross B, Baumann A, Prokop J (1989). Survival of Borrelia burgdorferi in antibiotically treated patients with Lyme borreliosis. Infection 17 (6): 355-9. PMID 2613324. ↑ Oksi J, Marjamaki M, Nikoskelainen J, Viljanen MK (1999). Borrelia burgdorferi detected by culture and PCR in clinical relapse of disseminated Lyme borreliosis. Ann Med 31 (3): 225-32. PMID 10442678. ↑ Hudson BJ, Stewart M, Lennox VA, Fukunaga M, Yabuki M, Macorison H, Kitchener-Smith J (1998). Culture-positive Lyme borreliosis. Med J Aust 168 (10): 500-2. PMID 9631675. ↑ 18.0 18.1 18.2 Lawrence C, Lipton RB, Lowy FD, Coyle PK (1995). Seronegative chronic relapsing neuroborreliosis. Eur Neurol 35 (2): 113-7. PMID 7796837. ↑ Honegr K, Hulinska D, Dostal V, Gebousky P, Hankova E, Horacek J, Vyslouzil L, Havlasova J (2001). [Persistence of Borrelia burgdorferi sensu lato in patients with Lyme borreliosis]. Epidemiol Mikrobiol Imunol 50 (1): 10-6. PMID 11233667. ↑ Straubinger RK, Summers BA, Chang YF, Appel MJ (1997). Persistence of Borrelia burgdorferi in experimentally infected dogs after antibiotic treatment. J Clin Microbiol 35 (1): 111-6. PMID 8968890 Full PDF. ↑ 21.0 21.1 21.2 Embers ME, Ramamoorthy R, Philipp MT (2004). Survival strategies of Borrelia burgdorferi, the etiologic agent of Lyme disease. Microbes Infect 6 (3): 312-8. PMID 15065567. ↑ Miklossy J, Khalili K, Gern L, Ericson RL, Darekar P, Bolle L, Hurlimann J, Paster BJ (2004). Borrelia burgdorferi persists in the brain in chronic lyme neuroborreliosis and may be associated with Alzheimer disease. J Alzheimers Dis 6 (6): 639-49; discussion 673-81. PMID 15665404. ↑ Ma Y, Sturrock A, Weis JJ (1991). Intracellular localization of Borrelia burgdorferi within human endothelial cells. Infect Immun 59 (2): 671-8. PMID 1987083 . ↑ Klempner MS, Noring R, Rogers RA (1993). Invasion of human skin fibroblasts by the Lyme disease spirochete, Borrelia burgdorferi. J Infect Dis 167 (5): 1074-81. PMID 8486939. ↑ Dorward DW, Fischer ER, Brooks DM (1997). Invasion and cytopathic killing of human lymphocytes by spirochetes causing Lyme disease. Clin Infect Dis 25 Suppl 1: S2-8. PMID 9233657. ↑ Montgomery RR, Nathanson MH, Malawista SE (1993). The fate of Borrelia burgdorferi, the agent for Lyme disease, in mouse macrophages. Destruction, survival, recovery. J Immunol 150 (3): 909-15. PMID 8423346. ↑ Georgilis K, Peacocke M, Klempner MS (1992). Fibroblasts protect the Lyme disease spirochete, Borrelia burgdorferi, from ceftriaxone in vitro. J Infect Dis 166 (2): 440-4. PMID 1634816. ↑ Brouqui P, Badiaga S, Raoult D (1996). Eucaryotic cells protect Borrelia burgdorferi from the action of penicillin and ceftriaxone but not from the action of doxycycline and erythromycin. Antimicrob Agents Chemother 40 (6): 1552-4. PMID 8726038 Full PDF. ↑ 29.0 29.1 Alban PS, Johnson PW, Nelson DR (2000). Serum-starvation-induced changes in protein synthesis and morphology of Borrelia burgdorferi. Microbiology 146 ( Pt 1): 119-27. PMID 10658658 Full Text. ↑ Benach JL (1999). Functional heterogeneity in the antibodies produced to Borrelia burgdorferi. Wien Klin Wochenschr 111 (22-23): 985-9. PMID 10666815. ↑ 31.0 31.1 Mursic VP, Wanner G, Reinhardt S, Wilske B, Busch U, Marget W (1996). Formation and cultivation of Borrelia burgdorferi spheroplast-L-form variants. Infection 24 (3): 218-26. PMID 8811359. ↑ Cluss RG, Goel AS, Rehm HL, Schoenecker JG, Boothby JT (1996). Coordinate synthesis and turnover of heat shock proteins in Borrelia burgdorferi: degradation of DnaK during recovery from heat shock. Infect Immun 64 (5): 1736-43. PMID 8613385 Full PDF. ↑ Kersten A, Poitschek C, Rauch S, Aberer E (1995). Effects of penicillin, ceftriaxone, and doxycycline on morphology of Borrelia burgdorferi. Antimicrob Agents Chemother 39 (5): 1127-33. PMID 7625800 Full PDF. ↑ Angelov L, Dimova P, Berbencova W (1996). Clinical and laboratory evidence of the importance of the tick D. marginatus as a vector of B. burgdorferi in some areas of sporadic Lyme disease in Bulgaria. Eur J Epidemiol 12 (5): 499-502. PMID 8905312. ↑ Schaller M, Neubert U (1994). Ultrastructure of Borrelia burgdorferi after exposure to benzylpenicillin. Infection 22 (6): 401-6. PMID 7698837. ↑ Phillips SE, Mattman LH, Hulinska D, Moayad H (1998). A proposal for the reliable culture of Borrelia burgdorferi from patients with chronic Lyme disease, even from those previously aggressively treated. Infection 26 (6): 364-7. PMID 9861561 Reprinted full text. ↑ Hulinska D, Bartak P, Hercogova J, Hancil J, Basta J, Schramlova J (1994). Electron microscopy of Langerhans cells and Borrelia burgdorferi in Lyme disease patients. Zentralbl Bakteriol 280 (3): 348-59. PMID 8167429. ↑ Duray PH, Yin SR, Ito Y, Bezrukov L, Cox C, Cho MS, Fitzgerald W, Dorward D, Zimmerberg J, Margolis L (2005). Invasion of human tissue ex vivo by Borrelia burgdorferi. J Infect Dis 191 (10): 1747-54. PMID 15838803. ↑ Brorson O, Brorson SH (1997). Transformation of cystic forms of Borrelia burgdorferi to normal, mobile spirochetes. Infection 25 (4): 240-6. PMID 9266264. ↑ Brorson O, Brorson SH (1998). In vitro conversion of Borrelia burgdorferi to cystic forms in spinal fluid, and transformation to mobile spirochetes by incubation in BSK-H medium. Infection 26 (3): 144-50. PMID 9646104. ↑ Gruntar I, Malovrh T, Murgia R, Cinco M (2001). Conversion of Borrelia garinii cystic forms to motile spirochetes in vivo. APMIS 109 (5): 383-8. PMID 11478686. ↑ Murgia R, Cinco M (2004). Induction of cystic forms by different stress conditions in Borrelia burgdorferi. APMIS 112 (1): 57-62. PMID 14961976. ↑ Liang FT, Yan J, Mbow ML, Sviat SL, Gilmore RD, Mamula M, Fikrig E (2004). Borrelia burgdorferi changes its surface antigenic expression in response to host immune responses. Infect Immun 72 (10): 5759-67. PMID 15385475 Full Text. ↑ Schutzer SE, Coyle PK, Reid P, Holland B (1999). Borrelia burgdorferi-specific immune complexes in acute Lyme disease. JAMA 282 (20): 1942-6. PMID 10580460. ↑ Coyle PK, Schutzer SE, Belman AL, Krupp LB, Golightly MG (1990). Cerebrospinal fluid immune complexes in patients exposed to Borrelia burgdorferi: detection of Borrelia-specific and -nonspecific complexes. Ann Neurol 28 (6): 739-44. PMID 2285261. ↑ Schutzer SE, Coyle PK, Belman AL, Golightly MG, Drulle J (1990). Sequestration of antibody to Borrelia burgdorferi in immune complexes in seronegative Lyme disease. Lancet 335 (8685): 312-5. PMID 1967770. ↑ (2004). Lyme Disease - United States, 2001-2002. Morb Mortal Wkly Rep 53 (17): 365-69. PMID 15129194 Full Text. ↑ 48.0 48.1 MacDonald AB (1989). Gestational Lyme borreliosis. Implications for the fetus. Rheum Dis Clin North Am 15 (4): 657-77. PMID 2685924. ↑ Markowitz LE, Steere AC, Benach JL, Slade JD, Broome CV (1986). Lyme disease during pregnancy. JAMA 255 (24): 3394-6. PMID 2423719. ↑ Williams CL, Strobino B, Weinstein A, Spierling P, Medici F (1995). Maternal Lyme disease and congenital malformations: a cord blood serosurvey in endemic and control areas. Paediatr Perinat Epidemiol 9 (3): 320-30. PMID 7479280. ↑ Gerber MA, Zalneraitis EL (1994). Childhood neurologic disorders and Lyme disease during pregnancy. Pediatr Neurol 11 (1): 41-3. PMID 7986291. ↑ Donta ST (2002). Late and chronic Lyme disease. Med Clin North Am 86 (2): 341-9, vii. PMID 11982305 Reprinted Full Text. ↑ 53.0 53.1 Cameron D, Gaito A, Narris N, Bach G, Bellovin S, Bock K, Bock S, Burrascano J, Dickey C, Horowitz R, Phillips S, Meer-Scherrer L, Raxlen B, Sherr V, Smith H, Smith P, Stricker R; ILADS Working Group (2004). Evidence-based guidelines for the management of Lyme disease. Expert Rev Anti Infect Ther 2 ((1 Suppl)): S1-13. PMID 15581390 Reprinted Full Text. ↑ Smith RP, Schoen RT, Rahn DW, Sikand VK, Nowakowski J, Parenti DL, Holman MS, Persing DH, Steere AC (2002). Clinical characteristics and treatment outcome of early Lyme disease in patients with microbiologically confirmed erythema migrans. Ann Intern Med 136 (6): 421-8. PMID 11900494 Full PDF. ↑ 55.0 55.1 Edlow JA (2002). Erythema migrans. Med Clin North Am 86 (2): 239-60. PMID 11982300. ↑ 56.0 56.1 Lyme Disease (Borrelia burgdorferi): 1996 Case Definition. CDC Case Definitions for Infectious Conditions under Public Health Surveillance. Retrieved 2006-03-15. ↑ 57.0 57.1 CDC Testimony before the Connecticut Department of Health and Attorney General's Office. CDC's Lyme Prevention and Control Activities. Retrieved January 7, 2009. ↑ 58.0 58.1 Brown SL, Hansen SL, Langone JJ (1999). Role of serology in the diagnosis of Lyme disease. JAMA 282 (1): 62-6. PMID 10404913. ↑ Hofmann H (1996). Lyme borreliosis—problems of serological diagnosis. Infection 24 (6): 470-2. PMID 9007597. ↑ Engstrom SM, Shoop E, Johnson RC (1995). Immunoblot interpretation criteria for serodiagnosis of early Lyme disease. J Clin Microbiol 33 (2): 419-27. PMID 7714202 Full PDF. ↑ Sivak SL, Aguero-Rosenfeld ME, Nowakowski J, Nadelman RB, Wormser GP (1996). Accuracy of IgM immunoblotting to confirm the clinical diagnosis of early Lyme disease. Arch Intern Med 156 (18): 2105-9. PMID 8862103. ↑ 62.0 62.1 Coyle PK, Schutzer SE, Deng Z, Krupp LB, Belman AL, Benach JL, Luft BJ (1995). Detection of Borrelia burgdorferi-specific antigen in antibody-negative cerebrospinal fluid in neurologic Lyme disease. Neurology 45 (11): 2010-5. PMID 7501150. ↑ 63.0 63.1 Paul A (2001). [Arthritis, headache, facial paralysis. Despite negative laboratory tests Borrelia can still be the cause]. MMW Mortschr Med 143 (6): 17. PMID 11247357. ↑ 64.0 64.1 Pikelj F, Strle F, Mozina M (1989). Seronegative Lyme disease and transitory atrioventricular block. Ann Intern Med 111 (1): 90. PMID 11247357. ↑ 65.0 65.1 Oksi J, Uksila J, Marjamaki M, Nikoskelainen J, Viljanen MK (1995). Antibodies against whole sonicated Borrelia burgdorferi spirochetes, 41-kilodalton flagellin, and P39 protein in patients with PCR- or culture-proven late Lyme borreliosis. J Clin Microbiol 33 (9): 2260-4. PMID 7494012 Full PDF. ↑ Klempner MS, Hu LT, Evans J, Schmid CH, Johnson GM, Trevino RP, Norton D, Levy L, Wall D, McCall J, Kosinski M, Weinstein A (2001). Two controlled trials of antibiotic treatment in patients with persistent symptoms and a history of Lyme disease. N Engl J Med 345 (2): 85-92. PMID 11450676. ↑ Kirsch M, Ruben FL, Steere AC, Duray PH, Norden CW, Winkelstein A (1988). Fatal adult respiratory distress syndrome in a patient with Lyme disease. JAMA 259 (18): 2737-9. PMID 3357244. ↑ Oksi J, Kalimo H, Marttila RJ, Marjamaki M, Sonninen P, Nikoskelainen J, Viljanen MK (1996). Inflammatory brain changes in Lyme borreliosis. A report on three patients and review of literature. Brain 119 (Pt 6): 2143-54. PMID 9010017. ↑ Waniek C, Prohovnik I, Kaufman MA, Dwork AJ (1995). Rapidly progressive frontal-type dementia associated with Lyme disease. J Neuropsychiatry Clin Neurosci 7 (3): 345-7. PMID 7580195. ↑ Cary NR, Fox B, Wright DJ, Cutler SJ, Shapiro LM, Grace AA (1990). Fatal Lyme carditis and endodermal heterotopia of the atrioventricular node. Postgrad Med J 66 (772): 134-6. PMID 2349186. ↑ Reimers CD, de Koning J, Neubert U, Preac-Mursic V, Koster JG, Muller-Felber W, Pongratz DE, Duray PH (1993). Borrelia burgdorferi myositis: report of eight patients. J Neurol 240 (5): 278-83. PMID 8326331. ↑ Abbott A (2006). Lyme Disease: Uphill Struggle. Nature 439: 524-525. PMID 16452949. ↑ Hayes E, Piesman J (2003). How Can We Prevent Lyme Disease?. The New England Journal of Medicine 348 (24): 2424-2430. PMID 12802029. ↑ Stricker RB, Lautin A, Burrascano JJ (2006). Lyme Disease: The Quest for Magic Bullets. Chemotherapy 52 (2): 53-59. PMID 16498239. ↑ Phillips SE, Harris NS, Horowitz R, Johnson L, Stricker RB (2005). Lyme disease: scratching the surface. Lancet 366 (9499): 1771. PMID 16298211 Reprinted Full Text. ↑ Phillips S, Bransfield R, Sherr V, Brand S, Smith H, Dickson K, and Stricker R (2003). Evaluation of antibiotic treatment in patients with persistent symptoms of Lyme disease: an ILADS position paper (PDF). International Lyme and Associated Diseases Society. Retrieved 2006-03-15. ↑ Harvey WT, Salvato P (2003). 'Lyme disease': ancient engine of an unrecognized borreliosis pandemic?. Med Hypotheses 60 (5): 742-59. PMID 12710914 Full PDF. ↑ Ziska MH, Donta ST, Demarest FC (1996). Physician preferences in the diagnosis and treatment of Lyme disease in the United States. Infection 24 (2): 182-6. PMID 8740119. ↑ Eppes SC, Klein JD, Caputo GM, Rose CD (1994). Physician beliefs, attitudes, and approaches toward Lyme disease in an endemic area. Clin Pediatr (Phila) 33 (3): 130-4. PMID 8194286. ↑ Wormser GP, Nadelman RB, Dattwyler RJ, Dennis DT, Shapiro ED, Steere AC, Rush TJ, Rahn DW, Coyle PK, Persing DH, Fish D, Luft BJ (2000). Practice guidelines for the treatment of Lyme disease. The Infectious Diseases Society of America. Clin Infect Dis 31 ((Suppl 1)): 1-14. PMID 10982743 Full PDF. ↑ Fallon BA, Keilp J, Prohovnik I, Heertum RV, Mann JJ (2003). Regional cerebral blood flow and cognitive deficits in chronic lyme disease. J Neuropsychiatry Clin Neurosci 15 (3): 326-32. PMID 12928508 Full PDF. ↑ Kaplan RF, Meadows ME, Vincent LC, Logigian EL, Steere AC (1992). Memory impairment and depression in patients with Lyme encephalopathy: comparison with fibromyalgia and nonpsychotically depressed patients. Neurology 42 (7): 1263-7. PMID 1620329. ↑ Logigian EL, Kaplan RF, Steere AC (1990). Chronic neurologic manifestations of Lyme disease. N Engl J Med 323 (21): 1438-44. PMID 2172819. ↑ 84.0 84.1 Fallon BA, Kochevar JM, Gaito A, Nields JA (1998). The underdiagnosis of neuropsychiatric Lyme disease in children and adults. Psychiatr Clin North Am 21 (3): 693-703, viii. PMID 9774805. ↑ Bakken LL, Case KL, Callister SM, Bourdeau NJ, Schell RF (1992). Performance of 45 laboratories participating in a proficiency testing program for Lyme disease serology. JAMA 268 (7): 891-5. PMID 1640618. ↑ Dressler F, Whalen JA, Reinhardt BN, Steere AC (1993). Western blotting in the serodiagnosis of Lyme disease. J Infect Dis 167 (2): 392-400. PMID 8380611. ↑ Ma B, Christen B, Leung D, Vigo-Pelfrey C (1992). Serodiagnosis of Lyme borreliosis by western immunoblot: reactivity of various significant antibodies against Borrelia burgdorferi. J Clin Microbiol 30 (2): 370-6. PMID 1537905 Full PDF. ↑ List of 321 Borrelia burgdorferi (Bb) strains from NIH/NLM/NCBI database as of 22 June 2001. Art Doherty's Lots of Links on Lyme disease. Retrieved January 7, 2009. ↑ Kaiser R (2000). False-negative serology in patients with neuroborreliosis and the value of employing of different borrelial strains in serological assays. J Med Microbiol 49 (10): 911-5. PMID 11023188 Full PDF. ↑ Hauser U, Wilske B (1997). Enzyme-linked immunosorbent assays with recombinant internal flagellin fragments derived from different species of Borrelia burgdorferi sensu lato for the serodiagnosis of Lyme neuroborreliosis. Med Microbiol Immunol (Berl) 186 (2-3): 145-51. PMID 9403843. ↑ Steere AC, Taylor E, McHugh GL, Logigian EL (1993). The overdiagnosis of Lyme disease. JAMA 269 (14): 1812-6. PMID 8459513. ↑ Burrascano JJ (1993). The overdiagnosis of Lyme disease [Comment]. JAMA 270 (22): 2682. PMID 8192761. ↑ Brenner C, Gabriel MC, O'Donnell JS (1993). Response to "The overdiagnosis of Lyme disease". The LymeNet Newsletter 1(10). Retrieved 2006-03-16. ↑ Fallon BA, Nields JA, Burrascano JJ, Liegner K, DelBene D, Liebowitz MR (1992). The neuropsychiatric manifestations of Lyme borreliosis. Psychiatr Q 63 (1): 95-117. PMID 1438607. ↑ Sherr VT (2000). Panic attacks may reveal previously unsuspected chronic disseminated lyme disease. J Psychiatr Pract 6 (6): 352-6. PMID 15990495. This page was last modified on 22 January 2009, at 05:25.